JUST a few seconds before entering the court, the thumping of her heart joins the beating of the drums as her world pauses for a while. As she ascends, Charisse “Chase” Orozco is welcomed by flashing lights, a cheering crowd, and the chilling court air. Immediately, she was captivated by the FilOil Flying V Center and became ready to face the crowd and tell the tale of two basketball teams going head-to-head in the 94th season of National Collegiate Athletics Association (NCAA). Standing with a microphone in one hand and a notebook in the other, Chase greets the frenzied crowd with a smile as she walks onto the court. Little does the audience know that her calm demeanor masks the two worlds she is juggling: listening to the happenings on the court in one ear and the chatter of the game analysts in the other. Chase is no stranger to the chaos that goes on in the court. She has been an NCAA courtside reporter for several months now, yet her enthusiasm for the job still resembles the thrill of a first-time viewer. Facing the crowd at the center of the court, Chase’s feet thrum lightly to the beat of the drums as she rehearses her opening report with the equally upbeat production team. After everything is set—the lighting established, sound checked, and game faces put on—Chase delivers her spiel masterfully, her smile not once leaving her face. The camera then cuts to the other reporters who are in the crowd, and Chase, along with her production team, walks to the sidelines of the court to work on her report for the next quarter. Being where she is now, the courtside reporter reminisces about how she reached the unreachable despite being timid and shy back then. “‘Pag naunahan ka na ng hiya, talo ka na. ‘Pag na-conquer mo na ‘yung hiya, parang half [of] the battle na ‘yun. You just need to believe in yourself,” she explains. Each hosting stint is an opportunity to triumph in yet another battle for the literature alumna. Chase is grateful for her experiences during her college years as she says these further trained and prepared her for courtside reporting. In each game, the passion that Chase has for the job rises to the surface. Still, courtside reporting for her is not all fun and games. She shares that the job requires a creative mind which can race against time. Although used to the job’s dynamics, the courtside reporter still faces challenges. Chase says that mistakes in courtside reporting are not as easy to retract as compared to mistakes made in events hosting. 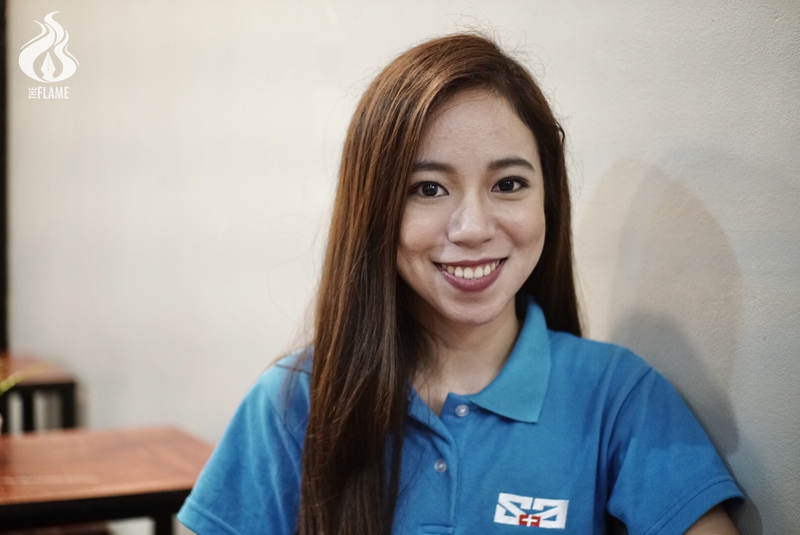 “Kapag reporting ka, ‘pag nagbitaw ka ng salita on camera, hindi mo na mababawi ‘yun, so it’s [about] being more cautious about what you say and I think it’s also [about] being careful,” she says. As the halftime period commences, Chase goes to the crowd and looks for willing interviewees who would proudly express how they feel about their team’s performance and show off their loudest cheers. Dealing with the audience has changed Chase’s perspective of other people. Her skills in writing and hosting also developed throughout her career. Becoming a courtside reporter was Chase’s dream as a college freshman, but after getting rejected, she was convinced that it was over for her. After graduation, however, a twist of fate led her back to her dream. Chase remains dedicated to the job even though courtside reporting puts emphasis on passion over stability. 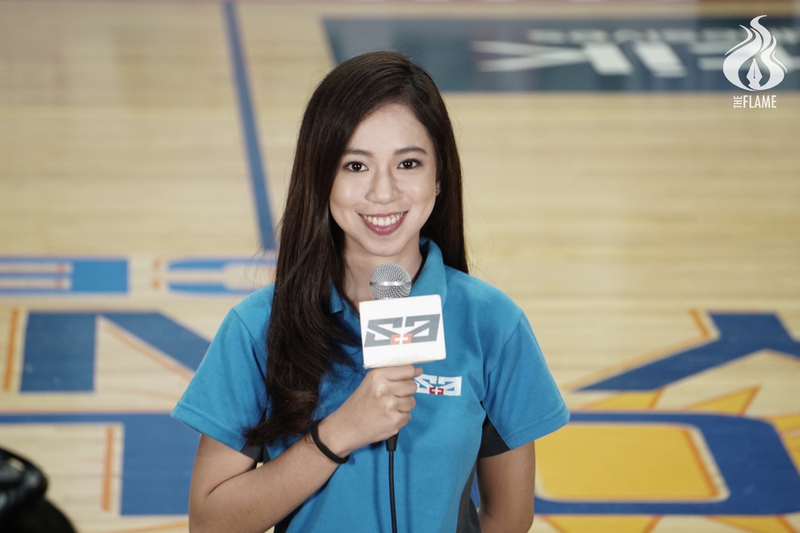 As a courtside reporter, she wants to fulfill her duties well and leave a mark on the viewers. After the game ended and a victorious team was declared and celebrated, Chase put down the mic, fixed her things, and walked out of the court which has become an empty space illuminated only by dimmed lights and filled with quiet rows. Editor’s Note: This story originally appeared in Vol. 54 Issue No. 1 of the Flame released Oct. 26. Minor edits were done by the editorial board. You can read the print version here.